After an intense hot vinyasa class the other day, my friend Logan and I went for a post-yoga drink at nearby Rèst-âü-Ránt. 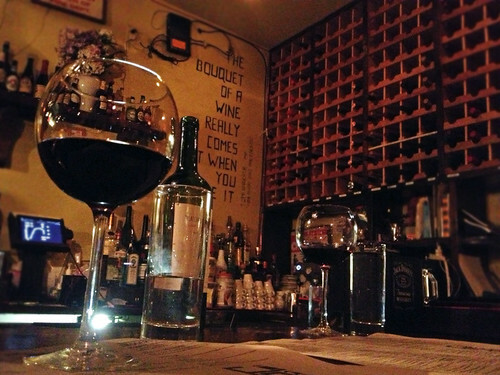 This wine bar has been on my radar for awhile, but since it’s a little far from my apartment I hadn’t checked it out yet. But the yoga studio with the hot room that I’ve been going to lately is quite close, so I jumped at the chance to finally step inside. Please forgive the quality of these photos – it was night, and I only had my iPhone. And, since I was a bit hungry too, I looked over the menu, thinking I might get a snack. 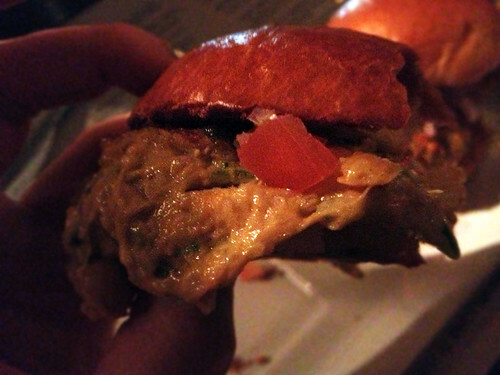 And then I saw “VEGGIE SLIDERS” – and of course I knew what I was ordering! 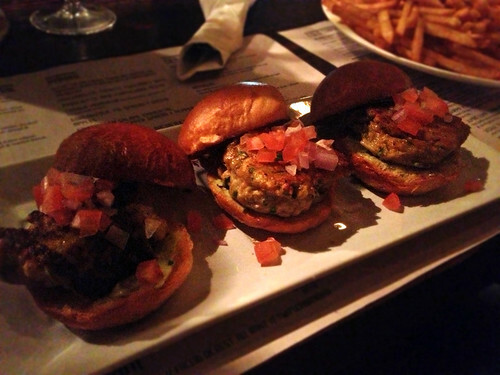 The three sliders were served on cute little brioche buns – the bread fresh, sweet, and lightly toasted. Quite perfect. The menu said the burgers were topped with “fresh tomato salsa” – but it seemed like it wasn’t more elaborate that diced tomatoes and red onions. There was also a nice tangy herbed mayo spread on the bun. 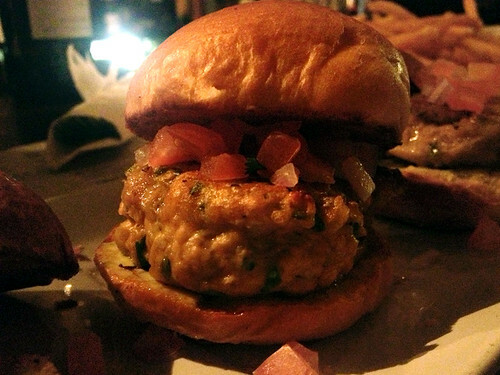 The patty itself tasted so good – beans and some kind of mash of vegetables, with lots of fresh herbs! It was fried to a crisp on top and bottom, but the inside was still so moist that it oozed out the sides as soon as I bit into the burger. I tried to lift up one of the patties to see the mayo on the bun underneath (I’m a bit of a freak when I’m eating a veggie burger for a review – I basically dissect it! ), but I couldn’t even lift the patty without it oozing into a big puddle. I asked if the sliders were vegan, and was told that they are not – they have some egg and possibly cheese to help bind them together, although it doesn’t seem like those ingredients are doing that job so well (maybe some ground flaxseed instead?). 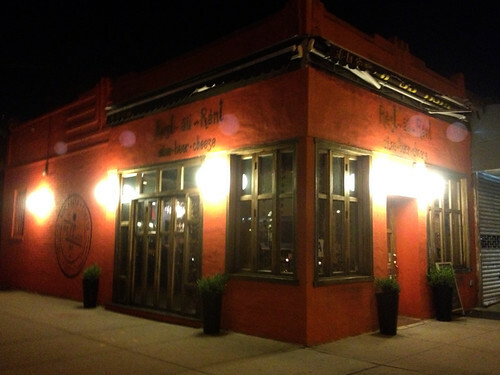 I was very impressed by the taste and the quality of the sliders, at such a reasonable price. And they weren’t too small either – three together definitely added up to more than one regular sized burger. Logan ordered some fries, which came with ketchup and a delicious chipotle mayo - I tried a few of them, and they were excellent. So if the sliders alone aren’t enough for you, I’d definitely recommend getting the fries too. And the bottle of red wine that we shared really hit the spot! Haha! Just proves that egg and cheese are not flawless binders. I do love kind of love a messy veggie burger though.